HARVEY opens this Friday at The Pavilion. Meet the cast and crew of this wonderful play about invisible friends, tolerance and unconditional love all wrapped up in hat full of laughs! DIRECTOR, MEREDITH JACOBS: Meredith is one of CHP’s longest serving members and most experienced directors and actors. With productions as varied as Amadeus to Steaming under her belt, Meredith has the ability to draw together a talented cast and present an outstanding production audiences love. She is thrilled with the end result with Harvey, saying everyone is going to love this mischievous rabbit and the magic he weaves wherever he goes. KATE GANDY is MYRTLE MAE: Kate has been appearing on the Pavilion stage for several years now, first appearing in 4000 Miles, followed by Love, Loss and What I Wore. Kate’s talents also extend to directing and she achieved outstanding success last year with her Dural Musical Society production of The Addams Family. Wherever Kate goes, laughter follows! Her Myrtle Mae has been described by Meredith Jacobs as the 40s teenager personified. LEIGH SCANLON is VETA LOUISE SIMMONS: Leigh has become a stalwart of CHP productions with too many appearances to mention in this limited space. Recent performances include Move Over Mrs. Markham, The 39 Steps, The Bible: The Complete Word of God Abridged, Frankie & Johnny and Wanted: One Body! Her ability to go books down so early in the rehearsal process is not only an inspiration to her fellow performers, but a huge relief to many a director! Leigh can always be relied upon to brandish a drill, hammer or paint brush during set building, run lights and sound when not on stage and she makes a mean cup of tea when carrying out her front of house duties. CHRIS LUNDIE is ELWOOD P. DOWD: Chris’ acting history at The Pavilion goes back a fair way, appearing in Where There’s A Will, and Secret Bridesmaids’ Business but it must be said most of us recognise Chris for his outstanding photography of our productions. Chris captures each play with individuality and a perception which brings the characters to life and presents the show in such a way that makes our promotional strategies a dream to display. Elwood P. Dowd was made famous when brought to the big screen by legendary actor, James Stewart and we can say without hesitation Chris has brought Elwood to our stage with all the sensitivity, honesty and charm vital to the story. Audiences are going to love Elwood! SANDY MOFFATT is Miss Johnson: Sandy is actually our ASM, working behind the scenes as an invaluable support to the SM. Miss Johnson makes a brief appearance on stage giving Sandy a small opportunity to step up and have a little share of the lights. It’s a fun thing to do, getting in and out of costume then getting back to the business of really getting the show moving. Sandy has done a sensational job gathering the many props used in Harvey. ANNETTE SNARS is MRS. ETHEL CHAUVENET: Another character who makes a brief appearance, Elwood’s much loved Aunt is the first person to show the audience the situation we have with Harvey. Comedy is Annette’s forte. Her first role was in Amadeus, and since then has appeared in Barefoot in the Park, Anne of Green Gables, Move Over Mrs. Markham, Shakespeare In Hollywood, Death By Chocolate, Bad Year for Tomatoes and The Book of Everything. Annette has been Stage Manager to many productions over the years, designed costuming for productions and also handles promotions and publicity for CHP. JACQUIE WILSON is NURSE RUTH KELLY: Jacquie’s comedic timing is invaluable to any production she appears in. You may remember her in Steel Magnolias, or Boeing Boeing where audiences were regaled with her sass and antics. You can expect more of the same from Nurse Kelly! JASON SPINDLOW is DUANE WILSON: Jason is one of those performers, he only has to walk onto the stage and you start smiling! An expressive face, rubbery body and speaking voice all combine to create hilarity with every character he portrays. Don’t think Jason is a one trick pony though as his portrayal of Dr. Patrick Sherwood in The Accused proved. Wilson spars with Elwood throughout the play, while at the same time he keeps a fanciful eye on Myrtle Mae! JULIAN FLORIANO is Dr. LYMAN SANDERSON: Some patrons may well be referring to Dr. Sanderson as Dr. McDreamy by the end of the night! Julian was discovered working at Costume Corner by a keen eyed costume designer who invited him to audition for Peach Season and the rest, as they say, is history. Since then he has graced our stage in Treasure Island and in our 2017 production of Ladies in Lavender as the ‘washed up violinist, Andrea’. Like Kate, Julian is also a talented director at Dural Musical Society and following on from the extraordinary success of Oliver! Julian will be directing CHICAGO later this year for DMS. DAVE WENT is DR. MARCUS CHUMLEY: Dave is one of the most experienced actors we have at CHP. An impressive CV of productions both locally and in the UK include a number of television appearances, professional stage productions as well as a huge number of nonprofessional appearances including CHP’s Gaslight, The 39 Steps, and Frankie & Johnny as well as Theatre on Chester, Hunters Hill Theatre and Pymble Players. Dave also directs productions with great success and our 2017 production of Wanted: One Body! was not only a great success at the box office but a real treat for cast and crew to work on. PENNY JOHNSON is Mrs. BETTY CHUMLEY and E.J. LOFGREN: Penny has been a member of CHP for several years now joining the fun of Death By Chocolate, Just Macbeth and appeared last year in The Women of Lockerbie. Her warmth and sense of fun shine through on stage and her characters quickly endear themselves to audiences. Dual characters in Harvey is a challenge Penny embraced with great enthusiasm, and nailed it! JEREMY JOHNSON is JUDGE OMAR GAFFNEY: NIDA trained, Jeremy has appeared on stage at CHP in the two hander classic, Ruby Moon as well as Ibsen’s Enemy of the People. He also directed the big cast productions of Don Quixote and Treasure Island bringing all the creative enthusiasm only Jeremy can dream up, resulting in tales told in scenic splendour and entertainment aplenty. Our Judge Omar is quite an astonishing man, as audiences will see when he first steps onstage! 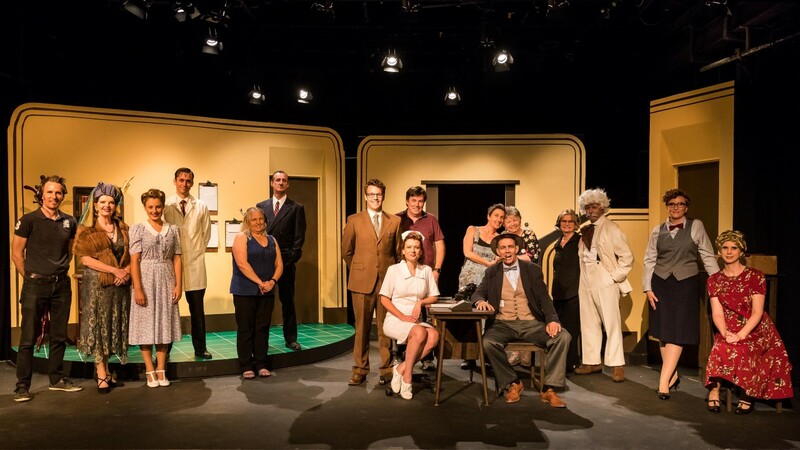 THE CREW is made up of an incredibly talented group of CHP members dedicated to bringing the production to the stage with a level of professionalism and enthusiasm no other community theatre group can claim. Denise Winters is Stage Manager, guiding the ship with a cool head, warm heart and a voice which must be answered! Assisting the SM and ASM is ASM/Set Master, Rod Bishop in only his second production at CHP. A fast learner, Rod has already cemented his position at The Pavilion with his reliability, strength and integrity. James Winters not only designed the lighting and soundscape for Harvey, he is in the Bio Box every night making it all happen. Talented doesn’t even begin to describe it! Gavin Jamieson ensures everyone has their 40s face on. Accountant by day, make up artist extraordinaire any chance he gets! Where would a rehearsal process be without the Prompt? In deep trouble, but thankfully we had Sandy Velini ensuring we all said every word in the correct order. In every production the set is a vital aspect of the presentation, and Steven Wimmer under instruction from Chris Lundie worked tirelessly and almost single handed to create the double sided masterpiece we have. Annette Snars created the 40s look for the characters, searching near and far and online for just the right dress, shoes, handbag to take us back to an era where fashion shone! Once again, Joshua McNulty has written original music for a Meredith Jacobs production. Josh’s music is recorded live by a talented group of musicians within the theatre, thank you Bernard Teuben for your assistance, and brings another dimension to the story, the personality of the characters and the tone of the evening. Gavin Woodford recorded a rehearsal and put together a great video for promotional purposes and Bob Seary handled photography responsibilities for Harvey, while Chris Lundie was up on stage being Elwood P. Dowd. We hope you enjoy HARVEY! Oh, and Harvey? He plays himself. You’ll know Harvey, you can’t miss him – he’s a 6 foot tall white rabbit!